Diigo - Diigo is a personalized, cloud-based learning management system that includes social networking capabilities. Dropbox - Store your files in the "cloud." Wherever you are put your stuff in Dropbox and get to it from your computers, phones, or tablets. Edit docs, automatically add photos, and show off videos from anywhere. Share photos with friends. Work with your team like you're using a single computer. Everything's automatically private, so you control who sees what. Even if your phone goes for a swim, your stuff is always safe in Dropbox and can be restored in a snap. Dropbox secures your files with AES-256 bit encryption and two-step verification. Facebook - Facebook's mission is to make the world more open and connected. Facebook has more users than most most country's populations. Connect with family, relatives, and friends to share thoughts, chat, and more. Goodwill Community Foundation's LearnFree has a good set of Facebook tutorials at this link. Flickr - This image and video hosting social network has over 3.5 million images uploaded daily by users and offers massive online photo storage. This site is a photography social media site. Similar to Instagram, but you just share high quality photos with others who are interested in photography. Flickr also gives you 1,000 GB of storage to store your photos in their "cloud" and with 1,000 GB you can keep taking amazing photos to share with photographers around the world! Google+ - "Google+ is the most recent major entry into the competitive field of the top social networking sites. It launched in mid 2011 and already has more than 500 million users. Google has the significant advantage of always being on your web browser at all times, so it advertises itself as a social experience that keeps you connected even when you're not on the specific Google+ site. This site is designed to be a total communication social network. You can find new friends and stay up to date with old friends." HubPages - HubPages is an open community of passionate people—writers, explorers, knowledge seekers, conversation starters. Interacting and informing. Sharing words, pictures and videos. Asking questions. Finding answers. It’s a rich and rewarding experience with a unique set of tools and resources to help Hubbers find and build an audience, easily create articles, and earn all sorts of rewards, from accolades to ad revenue. Over 38 million people explore HubPages every month. At HubPages, you’ll always discover an interesting take on what you were looking for. No matter how simple it seemed when you started your search. A Hub is so much more than an answer (though it might be that), so much more than an article (though it often starts there) -- it’s a rich and vibrant experience. And every Hub is original. From how to grill a steak to the top 100 songs of the ‘80s, our Hubs are full of engaging perspectives and inspired people. Instagram - Instagram is a fast, beautiful and fun way to share your life with friends and family. Take a picture or video, choose a filter to transform its look and feel, then post to Instagram — it's that easy. You can even share to Facebook, Twitter, Tumblr and more. It's a new way to see the world. Oh yeah, did we mention it’s free? Kik - Kik is an instant messaging app that is similar to texting but users have multiple options of talking with individuals, with groups and within a social networking environment. Users can also use Kik to send photos and files and send greeting cards. It combines texting with a social network. This is another one where parents should be aware of their children using it and should monitor their children younger than 17 on this site. For what you should be aware of check this article for more information. Linked-in - This is the premiere social networking site for jobs and job communities. Companies search Linked-in for job candidates. Job communities share resources and contacts. This is the site to use to beef up a resume and to look for job opportunities near you! Meetup - Meetup is the world's largest network of local groups. Meetup makes it easy for anyone to organize a local group or find one of the thousands already meeting up face-to-face. More than 9,000 groups get together in local communities each day, each one with the goal of improving themselves or their communities. Meetup's mission is to revitalize local community and help people around the world self-organize. Meetup believes that people can change their personal world, or the whole world, by organizing themselves into groups that are powerful enough to make a difference. MySpace - "Few social networking sites have gone through a bigger identity crisis than Myspace. This site was created in late 2003 and gained enormous popularity, starting in 2005. It was known for highly customized profiles, bulletins and Myspace messaging. The most recent update has unveiled the new Myspace. This social media service has realized that, in order to stay alive, it needs to cater to a niche market. Myspace now solely focuses on the music industry." Pinterest - Pinterest is a tool for collecting and organizing things you love. You can pin images you find on the internet. The pin will lead you back to the original site when clicked on. You can organize your pins into boards, where you organize your pins by topic. You could pin ideas for remodeling your bathroom to your House Projects board, for example. Boards can be ﻿secret ﻿or public, and you can invite other people to pin with you on any of your boards. Since it's a social network as well, you can share your pins, re-pin others pins, and follow other pinners (which now number in the tens of millions). Want to learn how to use Pinterest? Visit our How to page. Goodwill Community Foundation's LearnFree has a set of tutorials about Pinterest at this link. Reddit - Reddit is a social networking site used for entertainment purposes, where registered members share content and direct links. It has 174 million monthly unique visitors. With Reddit you can blog questions, opinions, ideas, etc. and get feedback from other members in the community. You can talk about the latest TV show drama or about a popular topic in society. This site gives freedom of speech to so many people! Scoop.it - Scoop.it was built to help the marketers, the consultants, and the entrepreneurs increase their visibility online. Scoop.it enables professionals to share important ideas with the right audiences giving them an opportunity to create and maintain a meaningful Web presence, a crucial component to the success of their business and career. Similar in feel to Pinterest, but with boards focusing on particular interests, such as technology, design, etc. Slack - Organize your team conversations in open channels. Make a channel for a project, a topic, a team, or anything—everyone has a transparent view of all that’s going on. 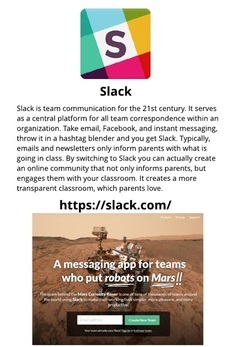 I've even seen families who use slack to keep each other informed about their lives. You could use it in the classroom to keep parents and students up to date on assignments or projects. Slack is free to use for as long as you want for teams of all sizes. Snapchat - This is an app you can get on most of you phones or tablets today. You can send a picture, video or text to a friend anywhere on this app. They are always updating Snapchat with new filters where you can be a bumblebee, a panda bear, or some other weird ones they come up with. This new form of social media helps you document a trip in a photo or video blog type way without having to post a million pictures to Instagram or Facebook. You can add photos or videos to your story and your friends can watch them in the app. They also are always asking for people in their community's to create a Geofilter for their area. A sign or logo that will appear for the city you're in. Check that out if you're artistic and think you have a good idea for a Snapchat Geofilter. StumbleUpon - This is a great site sharing website. When people who are part of the StumbleUpon community "stumble" across a great website, they share it here. StumbleUpon is a discovery engine (a form of web search engine) that finds and recommends web content to its users. Its features allow users to discover and rate Web pages, photos, and videos that are personalized to their tastes and interests using peer-sourcing and social-networking principles. Toolbar versions exist for Firefox, Google Chrome, Opera, Internet Explorer, and Safari. StumbleUpon also works with some independent Mozilla-based browsers. Native mobile StumbleUpon apps exist for Windows, iOS, Android, and the Amazon Appstore. Tumblr - Tumblr is a simple, easy site for people to make a blog and put whatever they want on it. Stories, photos, GIFs, TV shows, links, quips, dumb jokes, smart jokes, Spotify tracks, MP3s, videos, fashion, art, deep stuff. Tumblr is 239 million different blogs, filled with literally whatever. Twitter - Twitter is a real-time information network that connects you to the latest stories, ideas, opinions and news about what you find interesting. Simply find the accounts you find most compelling and follow the conversations. At the heart of Twitter are small bursts of information called Tweets. Each Tweet is 280 characters long, but don’t let the small size fool you—you can discover a lot in a little space. You can see photos, videos and conversations directly in Tweets to get the whole story at a glance, and all in one place. See it in action. Goodwill Community Foundation's LearnFree has a good set of tutorials for Twitter at this link. Whisper - A fairly new social media site that does the social media thing a bit differently. Whisper is an anonymous posting of your secrets and thoughts without having to own up to them. So if you have a weird thought of eating a sub sandwich and a pasta salad together, well your friends might say ewww... you're weird! But on whisper you can just send your crazy thoughts into the universe anonymously. Disclaimer: Parents be cautious about children using it as it isn't censored and a could be graphic. Also check this site for the low-down on tweens and whisper. YouTube - Founded in February 2005, YouTube allows billions of people to discover, watch and share originally-created videos. YouTube provides a forum for people to connect, inform, and inspire others across the globe and acts as a distribution platform for original content creators and advertisers large and small. Check out our How To page for more information on using YouTube.